Efforts to increase motorcoach and school bus fire safety have been done by the Federal Motor Carrier Safety Administration (FMCSA) which has contracted The John A. Volpe National Transportation Systems Center (Volpe) in order to update its latest analysis to include data on motorcoach fires that occurred from 2009–13. In addition, Volpe included an evaluation of school bus fires, expanded on the evaluation of the effectiveness of automatic fire detection and suppression systems, and identified fires caused by replacement of a diesel engine or automatic purging of diesel particulate filters, all contingent on the availability of applicable data. The Volpe report (FMCSA-RRR-16-016) has now been published. 2) recommending ways to prevent or reduce the severity of these incidents, especially through improving the effectiveness of vehicle inspection practices. Bus fire safety encompasses many aspects of design, operation, maintenance, evacuation and even first responders. All have a critical role in establishing effective standards and best practices but are typically the responsibility of different stakeholders in the development process. 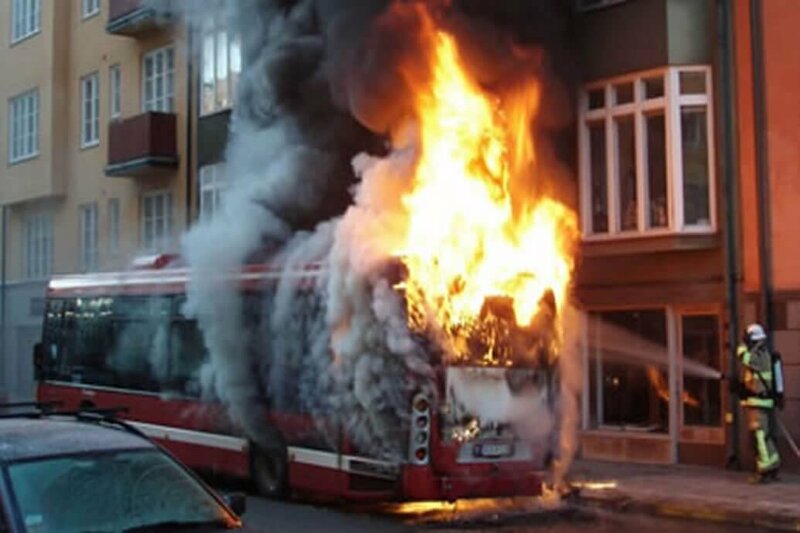 Buses pose many unique challenges in regards to fire risks. The varying modes of operation (city, highway, long distance), unique vehicle types (School, Transit, Coach, Demand Response) and design changes to meet new emissions standards provide the context for fire safety; but each fire hazard, whether it is an engine compartment, battery compartment, wheel well or even a luggage compartment, poses unique challenges in the way of geometry, airflow, clutter, flame spread and evacuation. The engine compartment which is one of the more well-known fire risks poses several challenges that effect the detection and suppression of fires. Ventilation, through fans and openings in the engine compartment, can produce high levels of airflow. This facilitates necessary cooling of the engine and compartment but can also increase the intensity and spread of flames which can have an enormous impact on fire detection times and suppression system effectiveness. The varying designs, geometry and clutter clearly represent risks which must be analyzed. The Volpe report (FMCSA-RRR-16-016) specifies that the most frequent areas of origin for motorcoach and school bus fires were the engine area, running gear, or wheel area. 77 percent of the motorcoach fires and 68 percent of the school bus fires (with known areas of origin) originated in these areas. Improve the quality, consistency, and completeness of the input of fire data. Identify and address reasons that fires are underreported or characterized as undetermined. Identify and link all relevant existing data systems. Develop a strategy for long-term maintenance of and future updates to NFIRS. Collaborate with USFA to enhance NFIRS data reporting structure and data element definitions relevant to highway vehicle fires. Enhance safety procedures and training requirements for drivers, mechanics, and other maintenance personnel. Increase stakeholder commitment to prioritizing fire safety, avoidance, and prevention over other non-safety-related performance measures. Encourage companies to continually re-evaluate and incorporate into training the most up-to-date information relating to fire precursors, especially that which is associated with OOS criteria or recalls. Promote an industrywide culture of safety that prioritizes the role of drivers and mechanics relative to the frontline role they play in fire prevention and mitigation. Consider design changes that could improve the fire safety of brakes, turbochargers, tires, electrical systems, and wheel/hub bearings. Include automatic failure warning systems and fire detection and suppression systems as standard on motorcoaches and school buses. Adopt a baseline standard for testing fire suppression systems to ensure a minimum level of protection. Support research and development in technologies for wheel area fire detection and suppression systems. Expand collaborative efforts to identify critical inspection items associated with fire risk. SPCR190 (Certification rules) – P-certification for vehicle manufacturers, operators and authorized service centers (workshops) with regard to fire safety. The P -certification will enable the manufacturer/body builder/operator/ service center (workshop) to certify their fire risk mitigation process. The client must be able to assure the quality of the entire design/manufacturing/maintenance process in order to secure the highest level of safety that is practicable and to keep the risks as low as reasonably practical. The safety risk management required in the P – certification is an element of the system of safety engineering functions that evaluate the effects of potential hazards and requires acceptance, control, or elimination of such hazards within the constraints of available resources. It is not the actual vehicle itself that will obtain a P certificate but the manufacturer as a proof of having certified their fire risk mitigation process. The P – certification system will be based on experience and knowledge gained through research, fire investigations and other industry professional services, as well as information provided by the customer. The P – certification will allow that personnel, strategies and techniques involved in fire safety mitigation of new and existing vehicles, to be kept at the highest performance level, that new information in this area is incorporated and updated into best practice working procedures. The P – certification will not be a guarantee for elimination of bus fires but ensuring that that the manufacturer/body builder/operator/ service center (workshop) will operate at the front line of vehicle fire safety engineering. Image: School bus fire safety – A fire risk assessment is being conducted. to achieve training focused on fire prevention etc. for design engineers and quality inspectors. Through the P – certificate, issued by SP as an independent third-party, the manufacturer/body builder/operator/ service center (workshop) will be able to support the growing market confidence and increase the credibility for their customers and their customers. The Volpe report (FMCSA-RRR-16-016) brings up the issue that the recommendations described in the report have been echoed throughout the motor carrier industry and various regulatory agencies. Further on it refers to the USDOT’s 2009 Motorcoach Safety Action Plan stated action items to enhance occupant protection in fire-related incidents, calling for the evaluation of the feasibility of more stringent flammability requirements for interior and exterior components and the evaluation of the need for regulations requiring the installation of fire detection and protection systems. The 2009 Motorcoach Safety Action Plan also stated that NHTSA had identified improving motorcoach fire safety requirements as a priority safety area; additionally, it advocated for follow-up research for evaluating the efficacy of fire detection and suppression systems and fire retardant and fire hardening materials. SP has done a lot of research in the area of bus fire safety. In one research project “Bus Fire Safety – a Nordic research project” (SP report 2008:41) it was identified that current requirements for interior materials (UNECE regulation 118) only require the materials to pass a simple horizontal spread of flame test (FMVSS 302) which is clearly insufficient, as even materials with poor fire performance can be approved. The fire safety requirements for other means of mass transportation, such as trains, passenger ships and airplanes, are considerably more stringent. This issue was brought up at UNECE (United Nations Economic Commission for Europe) Working Group on General Safety Provisions (GRSG) in Geneva where SP was engaged as Swedish technical expert to present proposals for better test procedures for these materials. The work of introduction of relevant levels of safety into regulations is ongoing. Fire safety is a continuous process. There are always things to be learnt from experience and actual fire incidences and important learning tools at the disposal of stakeholders which can provide critical input into best practices for design, operation and human interaction. Fire safety in buses has been the focus of significant research in recent years but much improvement still remains, in particular related to fire prevention and safe egress. The sharing of information and best practices can benefit all parties but most importantly, the passenger safety. Responsibility to ensure safe travel on buses should be shared by all parties. Establishing Standards and Best Practices will ultimately mean less legislation or at least legislation that is backed by sound scientific knowledge and best practices. The limited legislation, standards and best practices that are in place are not always readily available. SP will continue to expand the envelope of knowledge in support of bus and coach safety through research, testing and certification. The Volpe report (FMCSA-RRR-16-016) emphasizes that the analysis and conclusions in the study continue to highlight a significant opportunity to measure and improve the safety of motorcoach and school bus operations throughout the United States. It is clear that passenger-carrier fire safety is an important subject that warrants continued attention and increasing cooperation.